Manipulations like this become a lot more troubling in MMOGs, with millions of players whose time in-game is measured in weeks and months, not hours and days. In fact, players are even more susceptible to misjudging how much fun they are having when playing something as packed with reward systems as an MMOG. Dan Ariely, a behavioral economist at Duke and MIT and the author of the forthcoming The Upside of Irrationality, says that reward systems are a very easy and effective way of getting someone to continue performing a task. When I broached the subject of game rewards, he immediately brought up B.F. Skinner's behavioral psychology experiments. "Imagine that you're a rat," he says, "and you have two types of possibilities. You can either press a hundred times on a lever and then you get a piece of food, or it could be random. It could be anywhere between 1 time to 200 times, with an expected value of 100. And the question is: which one of those is more rewarding?" The fixed reward offers many advantages: it's reliable, you always know where you stand with it, and you know how long until you get your next reward. But its motivational power paled next to a random reward. "What Skinner found out was that the random schedule for reinforcement was more motivating," Ariely says. "And in fact, this became particularly salient when he stopped giving the rats any reward. And under those conditions, the rats kept on working for a really long time if they were in the random reward condition." The comparison between the situation of the rat in the random reward group, and the player grinding for random loot drops, is not hard to see. What matters is, despite this manipulation, whether people are still having fun. 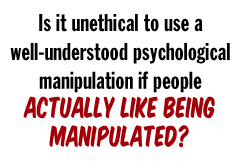 Is it unethical to use a well-understood psychological manipulation if people actually like being manipulated? Ariely has his doubts. "I would be very cautious about trying to maximize the fun people have," he says. "There was this paper by George Lowenstein in which he analyzes books which have been written by people who climb mountains. And these people are miserable every moment of the experience. It's painful, it's cold. They lose toes. Right? Very, very miserable. And at the end of it, if they reach the top, they want to go ahead and do it again. Now if you ask them, 'Are you happy? Are you satisfied?' they would say, 'No, no, no, no.' But they would then want to do it again." Rob Zacny is a freelancer writer living in Cambridge, Mass. More of his writing can be found through his blog.